I don’t read these books, of course. I just get them for their titles or cover design. Or, if they are published by Penguin, I get them because they are published by Penguin. Why? The answer to this question must lay deep in my psyche. A large team of psychologists, psychiatrists and psychotherapists would have to work in shifts to explain this behaviour. No, I’ve changed my mind. I will read them because they are clearly interesting. 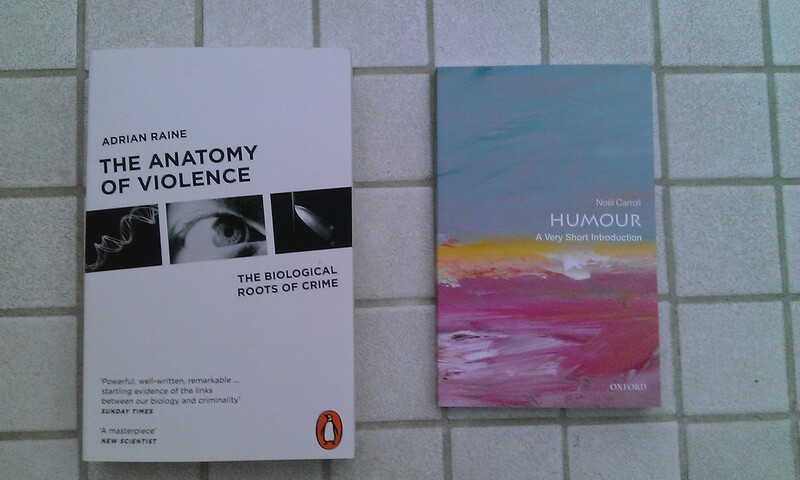 I’ll alarm myself with the Penguin and have a laugh with the short book on humour (except it won’t be funny). Anyway, who buys hard copies of books these days. Surely only losers! They collect dust, attract spiders and clutter up the place. So last century. So much more convenient to download e-books onto the e-device of my choice. And as for buying hardbacks, that’s the equivalent of acquiring a valve radiogramme to listen to the World Service. A short run this afternoon, simply to placate the Juneathon secret police who will surely persecute me if I fail to run everyday. It was hot, around 24c and I continue to feel tired running although this is mainly confined to the first 5 minutes. Tomorrow, I’ll be running with the club in the evening. This requires a more sustained effort but we warm up properly and I find this more manageable. This entry was posted in extreme weather, Juneathon, Uncategorized and tagged Bibliophilia, books, exercise, Juneathon, running. Bookmark the permalink.